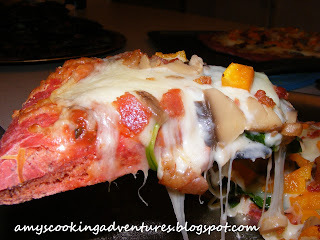 Since I discovered that I could put pumpkin into pizza, a whole new world of pizza dough has been opened to me. 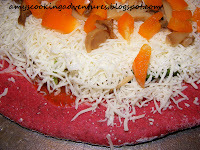 As I browsed The Cooking Photographer’s site, I found a recipe for Purple Pizza that used beets in the dough. 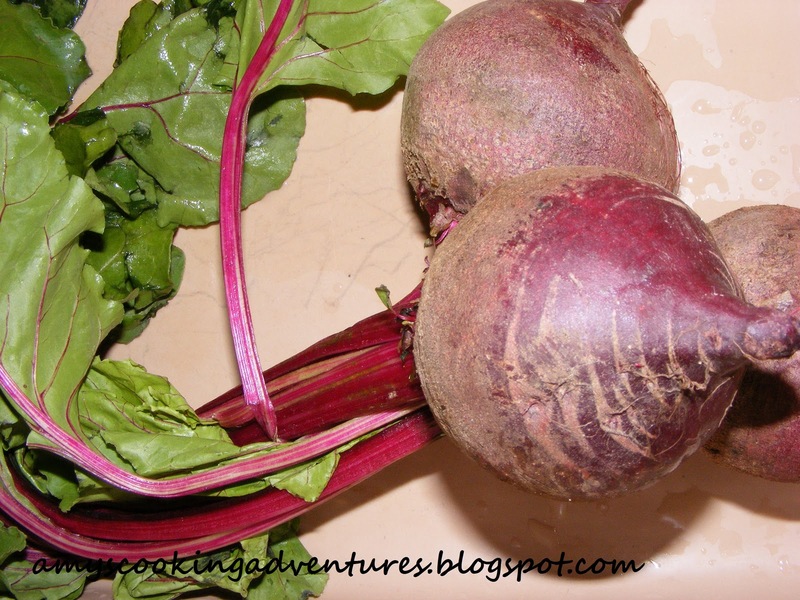 Now, I have never cooked with beets, but was completely fascinated by this recipe and decided to take on the challenge. 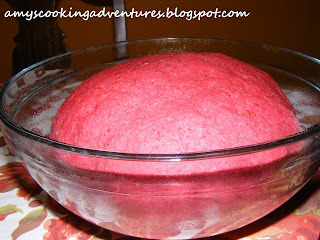 The dough turned out delicious and I couldn’t even taste the beets in the dough, much to my surprise! My 2 year old liked the colorful crust and enjoyed eating it and I was thrilled because he was eating beets! I’m not sure why, but my beet pizza turned out more magenta or red than The Cooking Photographer’s bright purple. Perhaps I had a different variety or beets or it could be that I added some extra beet juice to my dough, regardless, it was scrumptious! One word of warning, make sure your beets are cooked through, otherwise they will not process down to a nice smooth puree. It took me two tries to get a smooth enough puree, likely due to my lack of experience with the beets. Also, if you do not want to use flax or whole wheat flour, increase the all purpose flour to 3 ½ cups. Scrub beets under warm water. You do not need to peel them until after they are cooked (it will be much easier). Line a microwave safe plate with paper towels. Stab beets several times with a knife for venting. Cook in 5 minute increments until beets are thoroughly cooked and cut easily with a knife. My beets were rather large and took about 12 minutes to cook. Set aside to cool. When beets are cool enough to handle, peel and cut into chunks and place into a large measuring cup. Add water to fill half of the measuring cup (this will help the beets to puree smoothly). Pulse in the food processor until very smooth. Line a small colander with paper towels. Place the colander over a bowl to catch liquid. Place beet puree into the colander for 5-10 minutes to strain the liquid out. Reserve 3 tablespoons beet juice to add to dough..
Cut the stems and roots off, very close to the beet. Run under water to remove any dirt. Place in a pot and cover beets with water. Boil over medium heat for 30 minutes or until beets pierce easily with a fork (they will still be somewhat firm). Scoop beets into a colander and rinse with cold water. Reserve the water the beets boiled in. Once the beets are cool enough to handle, gently rub the skins with your fingers and the skins will peel off easily. Dice beets and place them in a food processor add enough liquid (use the liquid leftover from boiling the beets) to almost cover the beets. Pulse until beets are very smooth. At this time you can either freeze the puree in 1-cup increments or use it immediately. To use (or after thawing frozen puree) move the puree to a paper towel lined colander with a bowl beneath to catch the liquid. Once liquid has drained, about 10 minutes, the puree in ready to use. Reserve some of the liquid to add into the pizza dough. Mix yeast and honey into the warm water. Cover with a damp cloth for 5 minutes until yeast is foamy. Mix yeast beet puree, beet juice, salt, olive oil, flax, and flours in a large bowl. Turn out onto a lightly floured surface and knead until all the flour is incorporated and dough is smooth and no longer sticky. If your counter stains easily, use a mat. Spray a bowl with cooking spray. Place dough in bowl and turn to coat. Cover with a damp cloth and put in a warm, draft free place to rise. Let the dough raise until it is doubled in size, about 1 hour. Punch down dough. Split into two halves. Roll each half into 12-inch circles. Cover with sauce and your favorite toppings*. 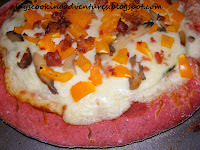 Place dough onto pizza pans or baking sheets and cook at 450 degrees for about 15 minutes or until crust is browned and cheese is melted. The pizza you see above is topped with sauce followed by turkey pepperoni, fresh spinach, mozzarella cheese, orange bell peppers, crumbled bacon, mushrooms, and white onions. Fun idea Amy! Great way to get veggies in there for the little ones too. You are on a roll with the Valentine's theme.